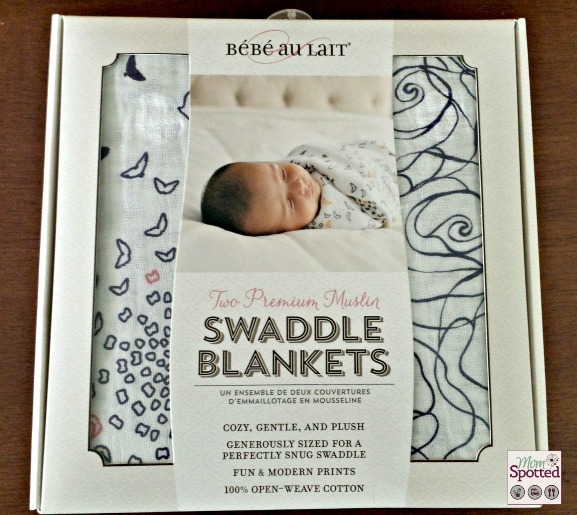 I have loved Bébé au Lait products ever since I was first able to review one of their nursing covers. You can find that review HERE. We also have a Bébé au Lait towel for Halli and it is by far our favorite towel at bath time. When Bébé au Lait came out with a new muslin collection I was so excited. Halli loves blankets. She never liked a pacifier and has always preferred a blanket to help soothe her. Our favorite material of blankets are muslin. 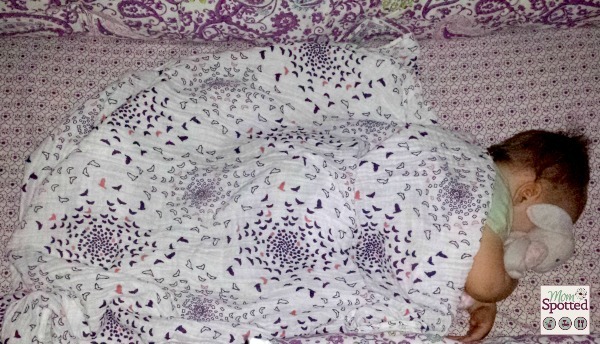 When she was a tiny infant muslin blankets were my go to for swaddling. Muslin is lightweight and breathable but also keeps baby warm. They also wash up great and I swear they get softer the more times you wash them. As Halli has gotten older I have used them as burp cloths, car seat or stroller covers, nursing covers, and we keep finding more ways to use them. Like all Bébé au Lait the quality of these blankets is fabulous! 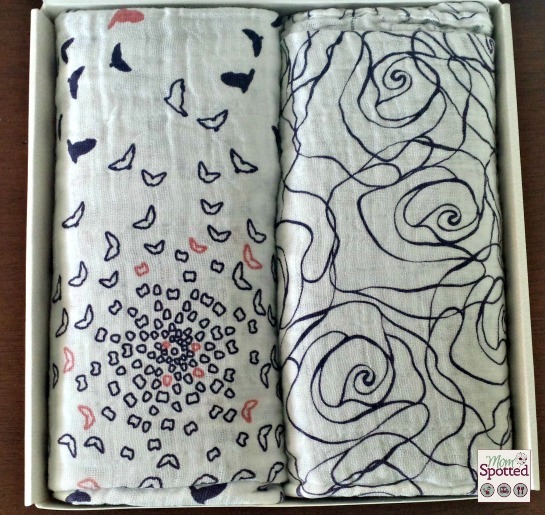 They are so soft and the patterns on the premium muslin blankie and swaddle sets are darling. There are two different sets, one that is gray and gold, and the other is pink and purple. We own the purple and pink swaddle set. One blanket is a deep purple and pink, with a pattern called Piper. 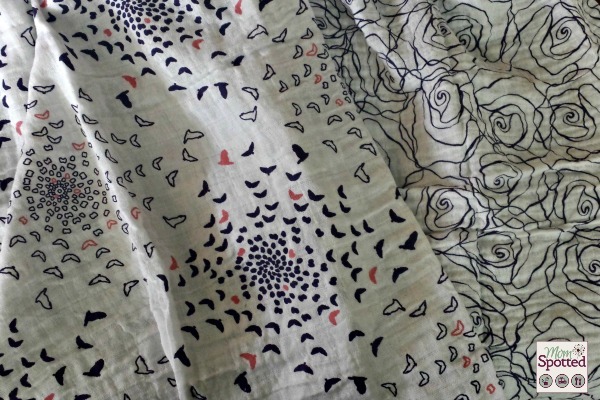 It has flocks of little birds that swirl around the blanket. The other blanket has the same matching deep purple color and has a pattern called Tea Rose. This blanket is gorgeous with roses that are all over the entire blanket. These are such a high quality 100% cotton muslin and are so much softer than our other blankets. Halli has been carting one around with her everywhere and they are my go to blankets to grab when we are running errands. Thank goodness they come as a set so while one is in the washer Halli can have the other one. Halli always has the one near by, she always has one to sleep with or she carries one around with her while we are playing. She absolutely loves these blankets! They are a really great size and would be excellent for swaddling. Right now Halli uses them as a lovey and at bedtime I snuggle her up in them. I also take them to church and play dates. The large size makes them great to spread out on the floor and put her toys on top of to play with. Halli and I both love these blankets! They have already been really loved on and they wash up great each time. I get asked all the time where I got them because they are such a gorgeous swaddle blanket. You and your baby would love these new Muslin swaddle blankets from Bébé au Lait. They would also make the perfect baby shower gift! The Bébé au Lait Premium Swaddle set retails for $32.00 and you can purchase them at Bébé au Lait or Amazon. wow this blankets are beautiful!! My 3 month old only sleeps if he is swaddled but i think this blankies are to cute for that , i would take them with us on walks in the carriage or car seat so i can show them off!! Love them!! So sweet sleeping with her lovies! I love bebe au lait products! I have a couple of their nursing covers is well. Seems like that’s been tucked away for along time now. Those blankies are so stylish – love it! I'm in the market for baby shower gifts this year and something like this would fit the bill. That is a pretty blanket. This would make for a perfect baby shower gift. I wish I had one of these when my son was a baby. Awww, she looks so sweet all tucked in with her blankies! They’re so beautiful! I wish I had these when any of our kids were little. Would be great during the summer months. 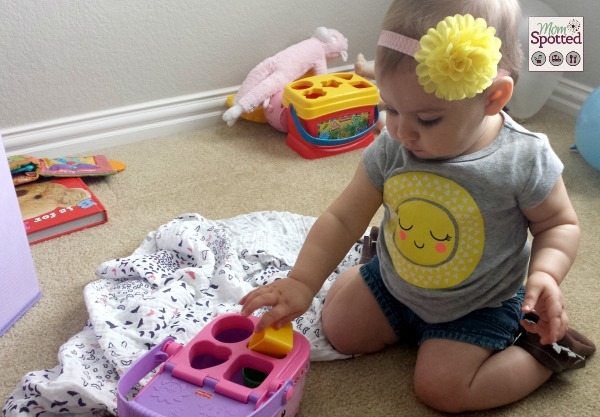 I love the idea of bringing it along and letting her play on it with toys. It’s really cute! That’s such a beautiful pattern. Those are beautiful! I could always use some nice blankets for my baby boy. I love Bebe au Lait products! These look really comfy and the print is amazing. So beautiful, I absolutely love the patterns! Love these blankets! They look super comfy and stylish! Love the patterns! They’re unusual, and very soft and pretty without being too feminine.